is honored on Panel 33W, Line 94 of the Vietnam Veterans Memorial. 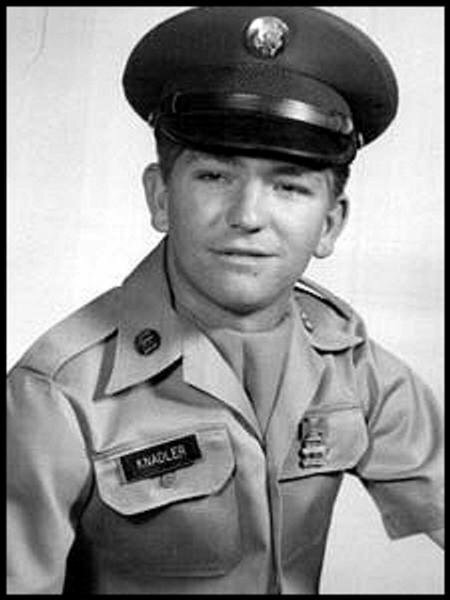 Specialist Four Robert Stanley Knadler, Served with the Headquarters and Headquarters Battery, 6th Battalion, 84th Artillery Regiment, First Field Force, United States Army Vietnam. Stanley, our parents were good friends and you were the first serviceman I ever knew that was killed in Vietnam. I was 15 and yet vividly remember my parents going to your services....the sadness. Two years later I met a man fresh home from Vietnam and we have been married 44 years now. He suffers from PTSD and while it is a struggle, it is well worth it to share his life. I so wish you would have been able to come home, to savor every moment of what life offered. I think of you often and you will never be forgotten Stanley. Thank you for your service, Sir.